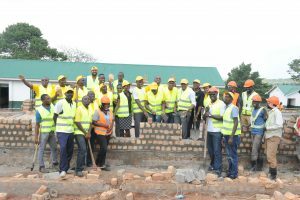 MTN Uganda staff has built a classroom block for PEAS Samling Nama High School in Mpigi District. Through its MTN Uganda Foundation, the telecom company decided to partner with PEAS by providing funds for educational support services. 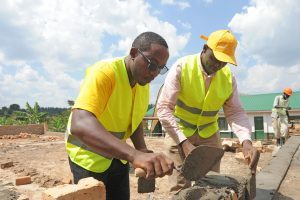 Speaking at the construction ceremony at PEAS Samling Nama High School located in Mpigi District, the MTN Foundation Manager Mr. Bryan Mbasa expressed MTN’s commitment to supporting education in Uganda as an ongoing, long-term project for their organisation. Furthermore, according to Mr. Valery Okecho, MTN Uganda’s Corporate Communications Manager, this is not the first time the telecom is working with PEAS. Their bond started in 2017 when MTN agreed to donate Shs735m which created 720 additional school places for needy students. This was done in various PEAS founded schools across the country that included; Toroma PEAS Secondary School in Soroti, PEAS Kichwamba High School in Kabarole District, Kityerera ARK PEAS High School in Mayuge District, and KucKigen PEAS High School in Lamwo district. Before MTN staff kicked off the building, Country Director of PEAS, Mr. Henry Senkasi thanked the MTN Foundation for the generous support towards the education of Ugandan children and the special partnership with PEAS Uganda. “The construction of classroom blocks will provide a much-improved learning environment for more students which will further improve their performance because modern facilities improve not only the school’s physical environment but also its learning culture. We are very grateful to MTN Uganda and MTN Foundation for this support” said Mr. Henry Senkasi. Sekansi also explained the reason behind the setting up of PEAS schools saying it is aimed at improving and increasing access to better education services in hard to reach communities of Uganda. PEAS runs 28 schools across Uganda, serving close to 15,000 learners.